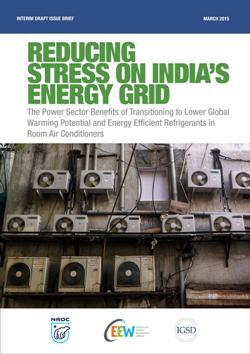 This paper by NRDC, CEEW and IGSD explores the energy efficiency and power sector benefits of air conditioning companies in India to “leapfrog” and phase down unsustainable technologies based on chemicals like HFCs with high Global warming potential and move to a future based on climate-friendly and energy-efficient refrigerants. In fact, a 2014 analysis by Council on Energy, Environment and Water (CEEW) found that a switch to lower-global warming potential room ACs with energy efficiency improvements could offer a 15% energy savings over a business-as-usual scenario, contributing to reductions of 31-38% in the global warming footprint of the residential AC sector in India. To open the report, click here.